Kangaroo on steroids? Look at those biceps! During my early research into red wolves, my aunt gave me this clipping from the Orange Leader newspaper dating back to 1986. 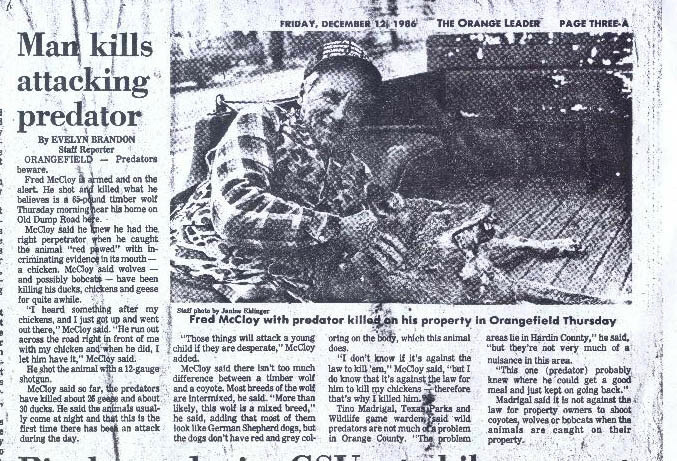 It shows a man with what looks very much like a red wolf he shot in Orange County in 1986. The official word was that all of the animals left were “coyotes” or at best wolf/coyote hybrids but at the very least it shows the red wolf genetic was strong in the area after the extinction declaration. To see more possible red wolf photos and videos click here.